It’s a familiar sight below the surface of food insecurity: between paying ever-increasing tuition and rent, students have little money left to buy food — a situation that is reality across Canadian universities. But instead of resigning to the ubiquitous trope of starving students surviving on cup ramen, many are now pushing back against this mentality at its core. “At this age, people should hopefully be able to focus on their education,” said AMS VP Academic and University Affairs Max Holmes. And as groups at different levels at UBC already express the need to push beyond stop-gap solutions, changes at both university and provincial levels around affordability become major focus points in their effort to close the hunger gap. So they turn to what they know best: advocacy. On a university campus, the issue of financial insecurity often goes hand in hand with tuition unaffordability — and UBC is no exception. In response, students have repeatedly stood up to steep tuition hikes by the university throughout its history. Most recently, the campus erupted in numerous protests organized by the AMS and other student groups in 2014 and 2015 following a proposal to increase international tuition by almost 50 per cent over three years. While the Board of Governors approved the increases in the end, they were reduced to around 42 per cent from the 2015 baseline. For increases in the single digits though, the AMS has usually only opposed those that go beyond the two per cent domestic cap, which is the legal limit mandated by the province. This year, the society is breaking from this stance to oppose all proposed tuition and fee increases by UBC — including any increases within the cap. While the move does not amount to a call for lower tuition as called for by a 2014 referendum, it is a step up from the tepid one-page submission on tuition to the Board of Governors last year. 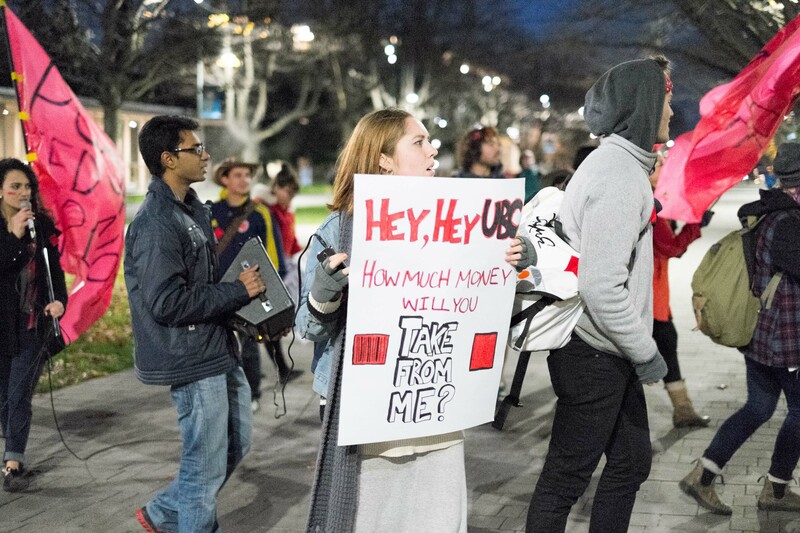 Holmes attributed the decision to a “lack of effort” from UBC in addressing students' disapproval of annual tuition increases, as well as a lack of transparency and progress around the university’s budget models and long-term enrolment plan. While the AMS does not explicitly mention food insecurity in its recent tuition consultation submission to the Board, Holmes acknowledged that it’s an issue that deserves a broader discussion given its scope. “About 40 per cent of students is looking at facing food insecurity at some point during their university career, so it's not really something that we can not talk about anymore,” he said, referencing data gathered in the 2018 AMS Academic Experience Survey (AES). “The tuition consultation every single year focuses on ‘Well, the university has inflationary costs.’ Well, why are we just focusing on the university's issues? … Why aren't they talking about how they can support students more?” he added. At the same time, Holmes emphasizes the role of the society’s ongoing advocacy around other major costs for students — like housing and textbooks — and funding support for groups prone to financial insecurity. Blake Smith, a PhD candidate in arts education and a former Food Bank client, testified to this advocacy effort’s importance. “I think there needs to be some kind of guaranteed funding for graduate students all the way through their entire degree,” Smith said. In emailed statements to The Ubyssey, VP Finance Peter Smailes and interim VP Students Andrew Parr acknowledged the issue of food and financial insecurity on campus. “ … we understand the costs of a university education in Canada can be challenging for some students and that issue is exacerbated in the Lower Mainland where housing costs are especially high,” reads a November 15 statement. In response, UBC is planning to build 14,500 on-campus beds by 2022 and roll out nano housing units next summer to address housing demand, which would make it “one of the largest providers of student housing in North America.” The two executives also pointed out that the university provided $87.2 million in funding and financial aid to more than 16,091 students in the last academic year — an increase from $74.1 million to 14,360 students the year before. “UBC’s Policy 72 is clear - no eligible student is prevented from embarking on or continuing an education at the university for financial reasons alone,” reads a November 6 statement. But this policy on access to UBC doesn’t cover international students — another group that is hard-hit by food insecurity. For example, while both international and domestic students can access emergency funds, only domestic students are eligible for standard bursaries. Regarding the AMS’s opposition to the proposed tuition increases, Smailes and Parr declined to delve into the specifics. “As the decision on how to proceed will ultimately rest with the Board of Governors and UBC has yet to make a final submission on this matter, it would be inappropriate to comment further,” they wrote on November 15 to The Ubyssey. The Board will discuss this year’s tuition consultation at the joint meeting between the Finance Committee and the Learning & Research Committee on November 26. Looking outwards, the AMS is advocating to the BC government. “We're really looking at food insecurity specifically as kind of a symptom of the larger crisis that students are facing, which is affordability,” said AMS VP External Cristina Ilnitchi. Instead of focusing specifically on the issue of tuition or calling for an international tuition increase cap, Ilnitchi opts for a “holistic” approach that also deals with other student-related costs. In her recent lobbying trip to Victoria, she urged the province to eliminate interest on student loans, provide funding for open education resource development and offer up-front grants that would cushion tuition and housing fees payments. “It’s not just the problem of tuition,“ Ilnitchi said. But with government attention spread more thinly as wildfires cause crisis for the second year in a row, it’s difficult to see immediate changes from this level of advocacy — even with a party in power that has expressed similar interests on the campaign trail. “Even though it may take a little longer to get there, the changes can be so impactful when they're made,” she said. Students are also not alone in these external conversations. Darran Fernandez, associate registrar and UBC Enrolment Services’ director of student support and advising, said his unit is conscious of the numerous costs that students face and that food insecurity comes up “on a regular basis” from those who come to the unit for support. As a result, he stressed the importance of providing an accurate view of the prevalence of food insecurity to organizations that are making policy decisions on education affordability. In an emailed statement to The Ubyssey, BC Minister of Advanced Education Skills and Training Melanie Mark acknowledged the high costs of post-secondary and resulting financial insecurity that students face. She also commended the service of food banks on campuses and their volunteers for providing immediate support for food insecure students. “A number of public post-secondary institutions have food banks to help students focus on their studies, complete their courses and support their families,” reads the statement. Details about these two efforts are still unclear. The BC student loan interest rate is currently at the prime interest rate, which was reduced in 2017 from prime plus 2.5 per cent. It remains to be seen if the next budget would include any incremental reduction or an elimination of student loan interest like what the AMS has lobbied for — and that the BC NDP government campaigned on in 2017. The province has also committed to cutting the provincial poverty rate by 25 per cent, but the full details of its poverty-reduction plan are unlikely to be released until March 2019. On the other hand, it has already put in place some initiatives that have or could have a direct impact on students. Some include implementing an incremental minimum wage increase to reach $15.20 per hour by June 2021 and convening a research committee — led by UBC economics Professor Dr. David Green — to explore a basic income pilot program. UBC itself also received $6 million for graduate grants and significant funding for student housing from the province. But much more is yet to be addressed. Still missing from this conversation is a discussion about the levels of public funding for universities, which have been falling across the country and increasingly shifting the burden onto tuition and fees payment by students, and especially so for international students. Ultimately, closing the hunger gap requires not only committed advocacy from different groups on campus — but also advocacy with its sights set high. “The AMS is committed to tackling these issues by continuously advocating not just targeted asks but also larger asks that look at basically rejuvenating [entire] systems,” Ilnitchi said. “We can't just sit around, moan and groan or come up with a little student initiative that lasts for two weeks … It has to be something broader in its impact and a little bit more aspirational in its target,” said Dr. Candice Rideout, a senior instructor in UBC’s faculty of land and food systems. Rising food bank usage is just the tip of the food insecurity iceberg.